March 9, 2016 – It is business as usual as NASA engineers prepare for an upcoming RS-25 rocket engine test at Stennis Space Center. They are well-versed on all of the pre-test work to be done, having conducted a very successful series of tests on an RS-25 developmental engine just last year. Nevertheless, the lead-up to this March 10 engine test on the A-1 Test Stand at Stennis has a very different – and exciting – feel about it. This RS-25 engine will fly. The flight certification test of RS-25 engine No. 2059 marks a major milestone in NASA’s return to deep-space exploration and its journey to Mars. Four RS-25 engines – all tested at Stennis – will help power the core stage of NASA’s new rocket, the Space Launch System (SLS), being built to carry humans on future deep-space missions. The RS-25 engines used on the initial SLS missions are flight engines remaining from the Space Shuttle Program. The engines are among the most proven in the world, having logged more than 1 million seconds of hotfire time during ground tests and 135 space shuttle missions. For the SLS vehicle, the engines will be fired at 109 percent thrust level. Together, four SLS engines will provide more than 2 million pounds of thrust and operate in conjunction with a pair of solid rocket boosters to power the SLS launch to space. The early SLS flights are focused on developing the capabilities needed to send humans to an asteroid by 2025 and to Mars in the 2030s. The SLS Block I configuration will have a minimum 70-metric-ton (77-ton) lift capability and be powered by twin boosters and four RS-25 engines. The next planned upgrade of SLS, Block 1B, would use a more powerful exploration upper stage for more ambitious missions with a 105-metric-ton (115-ton) lift capacity. Block 2 will add a pair of advanced solid or liquid propellant boosters to provide a 130-metric-ton (143-ton) lift capacity. In each configuration, SLS will continue to use the same core stage and four RS-25 engines. In that final version, SLS will be the most powerful rocket in the world. NASA conducted a series of RS-25 developmental tests last year at Stennis to validate the capabilities of a new controller – or “brain” – for the engine and to verify the different operating conditions needed for the SLS vehicle. The test series concluded in August; removal of the developmental engine from the A-1 stand cleared the way for installation of flight engine No. 2059. After testing is completed, that engine is scheduled to fly on the second SLS exploration mission (EM-2), planned as the first crewed flight of the new space vehicle. It is expected to carry four astronauts into lunar orbit to test key elements of the spacecraft. There are more chapters to come. 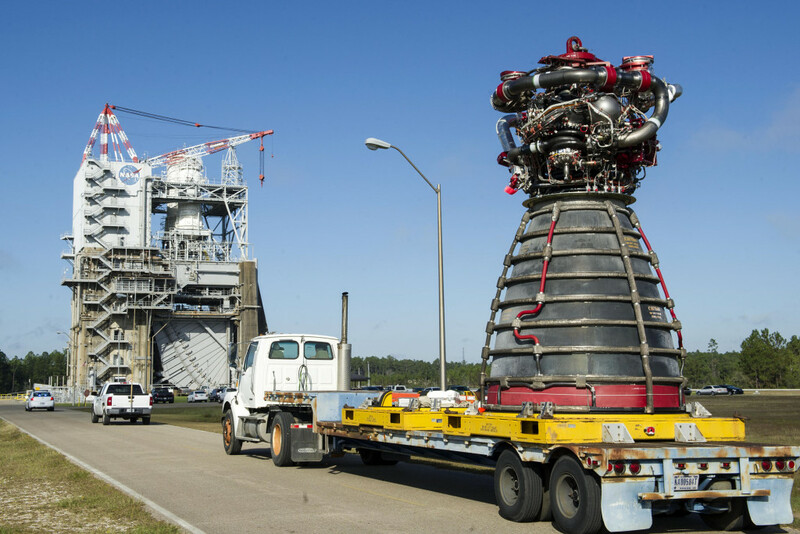 Following the March 10 firing, Stennis will continue to test RS-25 flight engines and conduct a development engine series to test new flight engine controllers. In 2017, Stennis will also test fire the core stage ahead of SLS’s first flight, EM-1 mission. The testing will involve installing the core stage on the B-2 Test Stand and firing its four RS-25 flight engines at the same time. In addition, NASA is working with Aerojet Rocketdyne, who built the RS-25 engine, to test new RS-25 engines being built for future missions.